01/25/2007 - Responsibility of chemical manufacturers and importers to provide MSDSs to one or more establishments owned and managed by same employer. Title: 01/25/2007 - Responsibility of chemical manufacturers and importers to provide MSDSs to one or more establishments owned and managed by same employer. This is in response to your correspondence, dated May 20, 2005, to the Occupational Safety and Health Administration's (OSHA's) Directorate of Enforcement Programs. This letter constitutes OSHA's interpretation only of the requirements discussed and may not be applicable to any questions not delineated within your original correspondence. 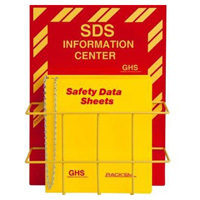 In your letter you requested an interpretation regarding material safety data sheets (MSDSs) and distribution requirements under OSHA's Hazard Communication standard (HCS), 29 CFR 1910.1200. Specifically, you asked about the responsibilities of the chemical manufacturers and importers to provide MSDSs to one or more establishments owned and managed by the same employer. OSHA's HCS [29 CFR 1910.1200(g)(6)(i)] states "Chemical manufacturers or importers shall ensure that distributors and employers are provided an appropriate material safety data sheet with their initial shipment and with the first shipment after a material safety data sheet is updated." You have asked for clarification related to this portion of the standard. Your paraphrased questions and our response are below. Question: If an employer/distributor has multiple establishments to which chemical products are shipped, can a manufacturer/importer send a single copy of an MSDS (or an updated MSDS) for each product to a central location as opposed to every physical address to which the product is shipped? Also, in order for this procedure to be compliant with the aforementioned paragraph of the hazard communication standard (HCS), would the manufacturer need to have a written understanding with the employer stating that it would be the employer who would ensure transmittal of the MSDS to their employees who utilize these chemicals at other physical locations? Response: According to OSHA's hazard communication standard, the manufacturer/importer has the obligation to ensure that an MSDS is provided to the employer. If the manufacturer sends chemical shipments to the employer at one physical location, then they need only send one MSDS with the first shipment of each of those products to the one location. If, however, the manufacturer sends shipments of chemicals to multiple locations that the employer manages, then the manufacturer would be obligated to send an MSDS with the first shipment of the chemical to each location. In addressing the second portion of your question, we reiterate that the HCS does have positive requirements in relation to the manufacturer's responsibilities in providing MSDSs to their customers. The manufacturer may not, by written agreement with the employer, waive his obligations to provide the MSDS information as is required by the regulation.